Wright set up Twitter handles asking for people's opinions on five party leaders. Using both the positive and negative comments received, she's written them down using her own handwriting to create portraits of the five leaders. Visitors will be invited to share their views of these politicians too. The exhibition (PDF) will also feature other political personalities like Churchill, Mandela, John F Kennedy and Margaret Thatcher. We've seen Wright's work before and it's even more impressive in person. Free, 31 April to 15 May. We're big fans of the work Arts Emergency do in providing mentoring for young people wanting to get into the arts and working to counter the belief that the arts are just for the upper and middle classes. This exhibition combines their manifesto with works by Bob and Roberta Smith and his students at the university. There are also some great interactive elements where visitors can 'prescribe' a message they would like to have received when they were 16, and they will receive some 'medicine' in return. Free, until 2 May. 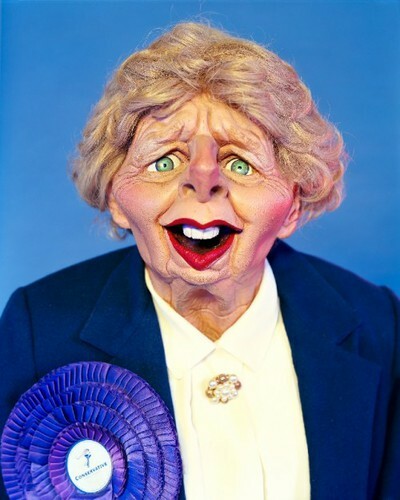 In 2010, Simon Roberts was made the official British Election Artist. He has travelled the country capturing electioneering across many constituencies and for different parties. 25 of these images will feature in this exhibition at Photofusion in Brixton. Free, until 22 May. Street art is one of the most politically active genres of art. This exhibition will have a strong street art vibe including works by the Godfather of stencil art Blek le Rat. Expect attention grabbing works with equally powerful political messages. Free, 1-23 May. This article has been expanded upon after it was first published.